Submerged neighborhoods and demolished homes were seen on the Florida Panhandle. 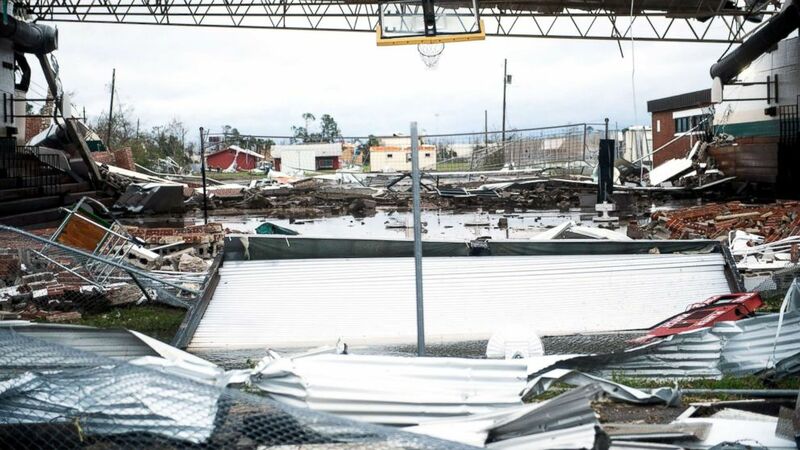 Hurricane Michael, the worst storm to strike the U.S. in nearly 50 years, has left unbelievable destruction in its wake after pounding into the Florida Panhandle Wednesday and then tearing through Georgia and the Carolinas. The power of the storm, which was a powerful Category 4 at landfall, was evident in dramatic footage that showed demolished homes, submerged neighborhoods, piles of downed trees and buses and even a massive freight train tossed around like toys. At least 17 people have died from the storm from Florida through Virginia. (Gerald Herbert/AP) People take belongings from their destroyed home after several trees fell on the house during Hurricane Michael in Panama City, Fla., Oct. 10, 2018. (Brendan Smialowski/AFP/Getty Images) Storm damage is seen after Hurricane Michael in Panama City, Fla., Oct. 10, 2018. (Pedro Portal/Miami Herald via AP) A woman inspects damage to her family property in the Panama City, Fla., after Hurricane Michael made landfall in Florida's Panhandle, Oct. 10, 2018. 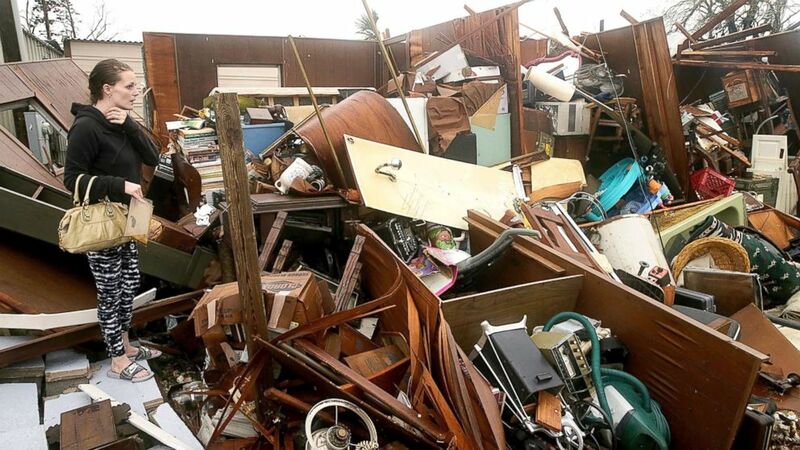 As Michael came ashore, ABC News meteorologist Ginger Zee witnessed the terrifying and devastating storm surge in Mexico Beach, Florida, rip a house from its foundation. The conditions so bad that Zee and her team lost the ability to broadcast. "All I can see is devastation," Zee said. Our ability to broadcast is gone but we are safe. Wanted to let you all know. 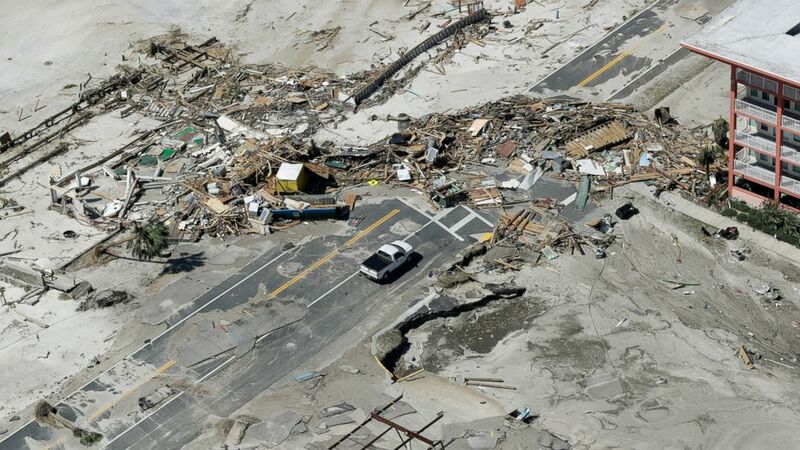 On Thursday, Zee ventured out onto the sand- and debris-covered highway and posted this photo of the aftermath in Mexico Beach. "Finally have service and will try to tweet the photos I am able to as I know many of you are desperate to know what’s left," she wrote. "Survivors gave me numbers to call and I have. Powerful phone calls telling their loved ones they are alive." These before and after images show how Michael demolished Mexico Beach. 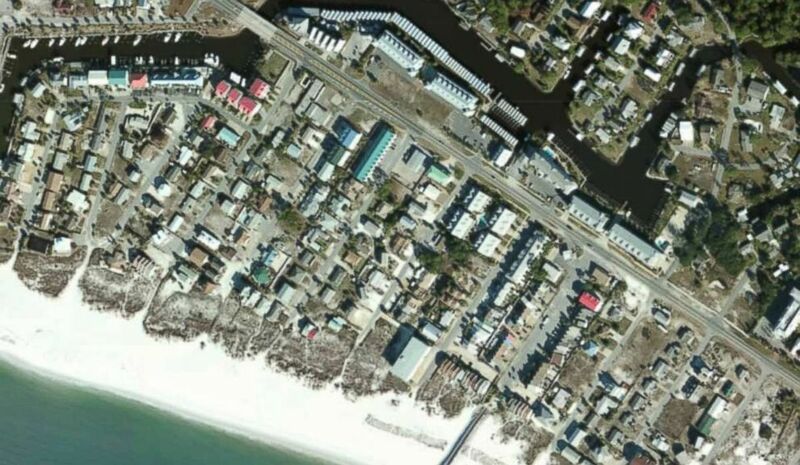 (NOAA) Mexico Beach, Fla., seen before Hurricane Michael, in this image released by NOAA. 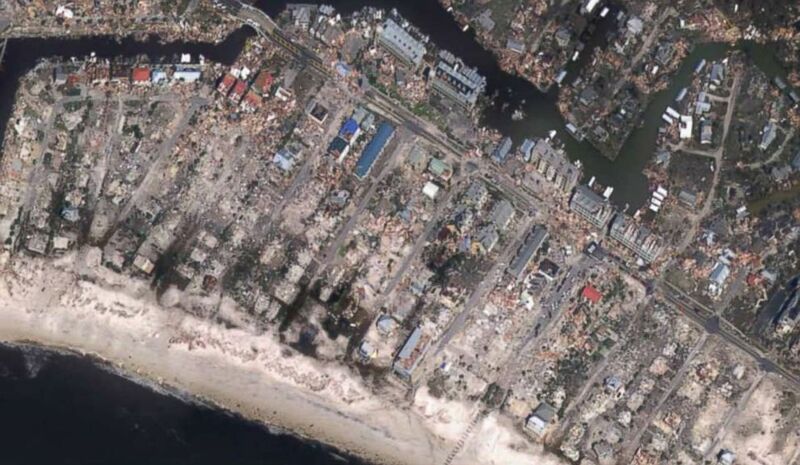 (NOAA) Mexico Beach, Fla., seen after Hurricane Michael, in this image released by NOAA. Before Michael hit, law enforcement made a list of everyone in the small Mexico Beach community who stayed behind. Now, "a tremendous number of people" are "unaccounted for," Mark Bowen, chief of emergency services in Bay County, which encompasses Mexico Beach, told "Good Morning America" Friday. Rescuers' top priority Friday is a "meticulous" search process, he said, "everything from looking for bodies to looking for injured persons." 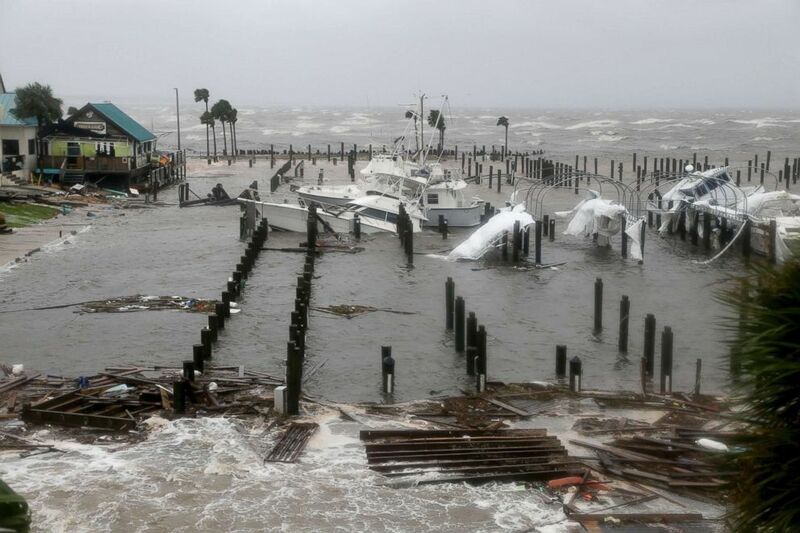 (Douglas R. Clifford/AP) Storm Surge retreats from inland areas, foreground, where boats lay sunk and damaged at the Port St. Joe Marina, Oct. 10, 2018 in Port St. Joe, Fla.
"Fire stations were destroyed, police stations were destroyed," Bowen said. "Public safety agencies are only taking highest priority calls right now ... heart attacks, you know, major trauma. ... An enormous amount of 911 calls are going unresponded to because we’ve got this priority to search and rescue. So it’s a terrible thing." Another photo out of Mexico Beach shows an American flag standing amid piles of debris. 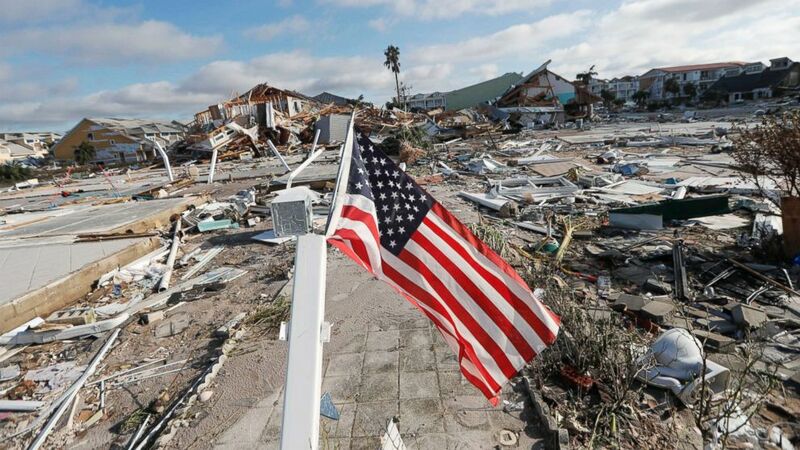 (Gerald Herbert/AP) An American flag flies amidst destruction in the aftermath of Hurricane Michael in Mexico Beach, Fla., Oct. 11, 2018. Portions of the power grid along the coast including Mexico Beach were completely destroyed by the strong winds and storm surge and will need to be rebuilt, according to Duke Energy. Video from Apalachicola, Florida, shows dozens of abandoned vehicles submerged in water and other destruction left in the wake of the storm. The winds were strong enough to pierce the windshield of a car in Panama City Beach. (Gerald Herbert/AP) A woman checks on her vehicle as Hurricane Michael passes through in Panama City Beach, Fla., Oct. 10, 2018. 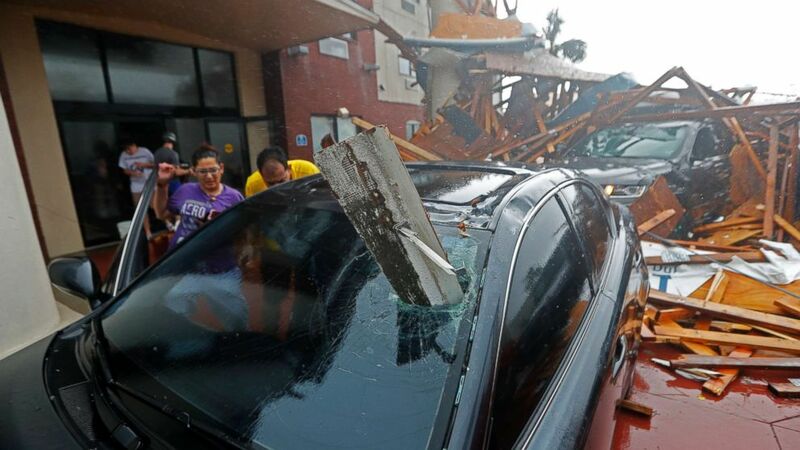 One building, seen in a photo posted by ABC affiliate WBMA from Tuscaloosa, appears to have crumbled beneath the hurricane's 150 mph winds. Northwest Florida Daily News reporter Annie Blanks tweeted video footage of seawater flowing inside the Dewey Destin's seafood restaurant near Mexico Beach. The Lanark Fire Department tweeted video of a terrifying storm surge creeping up the shore, bringing seawater into a carport of a beachfront home. Strong waves overtook a boat ramp to Choctawhatchee Bay at Legion Park, a video posted to Instagram by Lars Rygaard shows. Customs and Border Patrol captured this video of a Black Hawk aircrew rescuing two people from an area that was inaccessible by car. Tangie Horton, who lives inland from Mexico Beach, tearfully detailed the devastation in a Facebook video, saying, "I don’t know if I can get through this or not but we’re okay." "This is where we were at when it hit ... can you imagine the people that was in Mexico Beach? We can’t find four of our friends but they’re still looking," she said. "It's just so sad ... it's just devastating." She said she felt lucky that she made it through alive and with her camper intact. Workers at the Walton County Animal Shelter were seen comforting dogs and cats up for adopting as they ride out the storm. Love through the storm. ?? Michael is the strongest hurricane to strike the Florida Panhandle since the mid-1800s, according to FEMA. Maj. DeWitt Revels of the Florida Army National Guard told ABC News Michael is "probably the worst one that I've seen." "We're members of the community, too, so we all feel it," he added. (Gerald Herbert/AP) Rescue personnel perform a search in the aftermath of Hurricane Michael in Mexico Beach, Fla., Oct. 11, 2018. 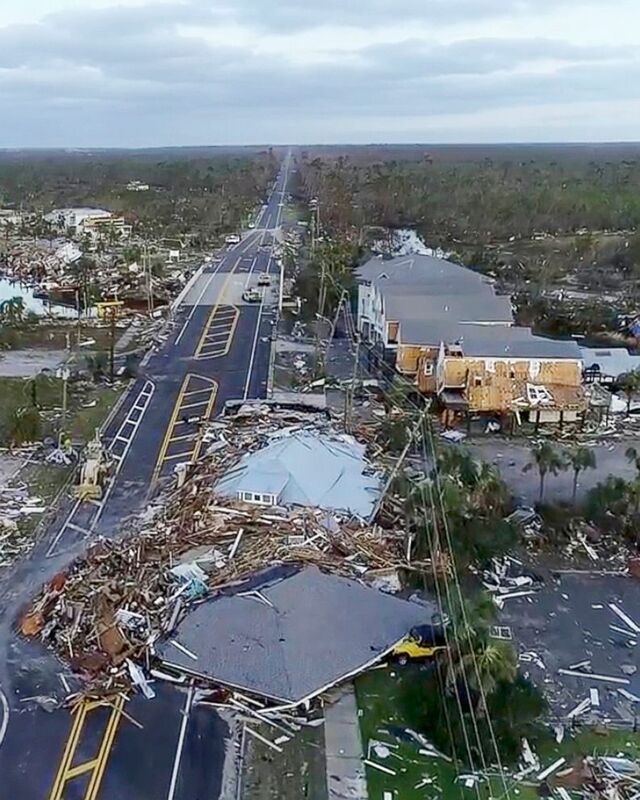 (SevereStudios.com via AP) In this image made from video, damage from Hurricane Michael is seen in Mexico Beach, Fla., Oct. 11, 2018. After pummeling Florida, Michael barreled through Georgia. 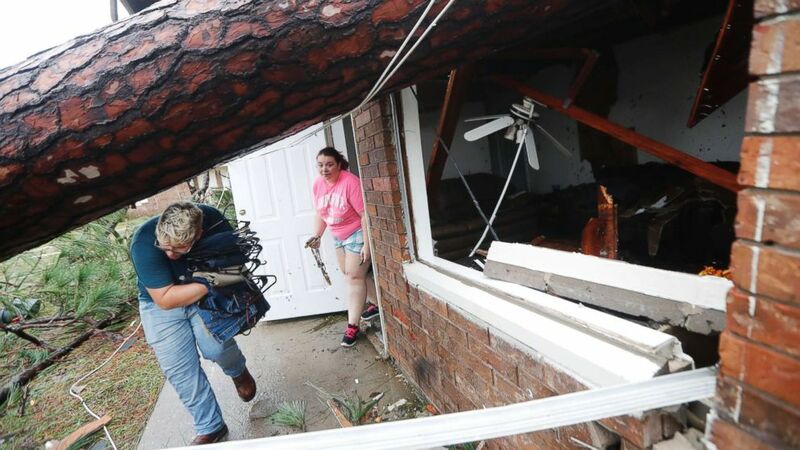 The weakened storm then continued north, toppling trees and power lines in North Carolina and triggering flash flood warnings in areas like Roanoke, Virginia. ABC News' Kelly McCarthy contributed to this report.